Stonewall Rebellion! These "Stonewallers" are heroes of the G.L.B.T. communities. 3:15 pm - 5 p.m.
S.V.A. pictures shown above include the original 8-color Gay Pride Flag, the landmark Stonewall Club, the famous "Stonewall Car" leading a Gay Pride Parade in NYC, the jukebox "Songs of The Stonewall Club" and legendary Stonewall Veterans such as Queen Allyson, Bert Coffman, Cristina Hayworth, Jeremiah Newton and Rev. Magora Kennedy. S.V.A. never lends, sells or trades its private email list! earn$, deserve$ and appreciate$ your $upport! The S.V.A. has the highest level of validation and security. You can also download the S.V.A. support form below and mail it to the S.V.A. The National STONEWALL Rebellion Veterans Association ("S.V.A.") is comprised of the actual, surviving and active veterans of the historic 1969 Gay, Lesbian, Bisexual and Transgender ("G.L.B.T.") 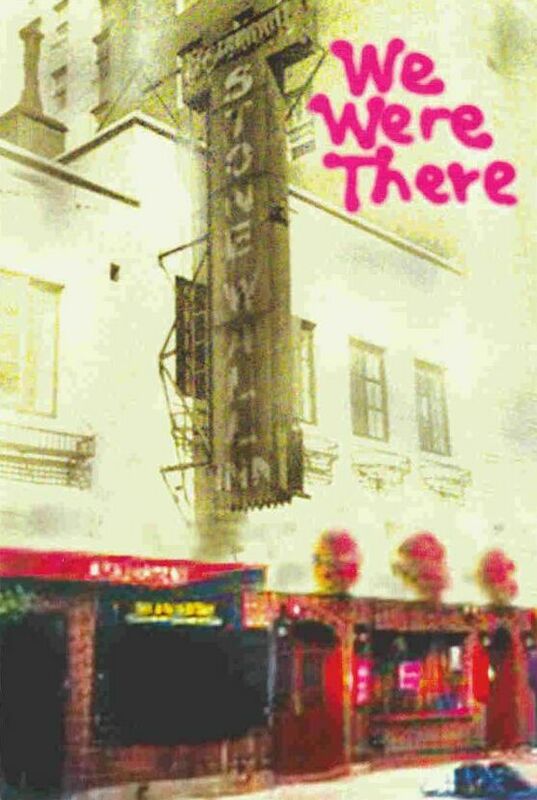 monumental 1969 Stonewall Rebellion at and the former regular patrons of The Stonewall Club (no one called it the "Inn") who were subject to New York City Police Department raids at 51 and 53 Christopher Street off Seventh Avenue in Greenwich Village, New York, U.S.A. The rebellion (it was never a 'riot') lasted five inconsecutive nights (they were not 'riots') from Friday, June 27th, to Thursday, July 3rd, 1969. June 28th was the second (not the first) night of the uprising. On two nights (Monday, June 30th and Tuesday, July 1st) it rained. So, no one wanting to get wet, the rebellion was postponed until Wednesday, July 2nd! Symbolically, it was on the 'seventh day', July 4th, American Independence Day, that the united G.L.B.T. community triumphantly celebrated our historic Gay independence -- although not our full civil rights, not all of our freedoms! However, the long G.L.B.T. community process ignited in earnest! The S.V.A. was founded on the following Friday, July 11th, 1969, literally just a stone's throw from The Village in a big New York delicatessen / restaurant known as The Victoria Kosher Deli Restaurant on 14th Street just off Fifth Avenue. The S.V.A. organization is a cultural, historical, educational, advocacy and politically-aware, non-profit, volunteer organization primarily, but not exclusively, for the G.L.B.T.S. communities. That's why the S.V.A. added an "S" for straight! It includes the SVA's non-Gay members, sponsors, friends, supporters and advertisers. The S.V.A. is registered (since 1969) with the New York State Attorney General's Charities Bureau and listed with the City of New York's non-profit organizations. The "STONEWALL Newzletta" is the popular publication of the S.V.A. Originally a two-sided news flyer, it grew to a 16-page newsletter with commendation letters from public officials and political candidates as well as Gay and non-Gay organizations. The newsletter includes business, non-profit groups, public service and public official advertisements. An "S.V.A. Speakers Bureau" of Stonewall veterans is available to other organizations and groups and for events and forums. The Stonewall veterans of the 1969 Stonewall Rebellion led the annual New York Gay Pride parades in Manhattan (the first in 1970 to the 49th in 2018), Queens (through 2004), Long Island (until 2000), Brooklyn (through 2008), The Bronx (1998 to 2002 when they queerly ended after five years) and sometimes across the huge Verrazzano Bridge into Staten Island, New York City. The S.V.A. has also been the guest leaders of Gay Pride parades throughout America. The S.V.A. leading any New York City parade is always with the classic, eye-catching and now famous blue 1969 convertible also known as the "Stonewall Car" -- with the wide white wall tires, white leather interior and the colorful magnetic signs that read "1969 Stonewall Car"! Spanning a few decades, the S.V.A. periodically partakes parading with our "S/W Car" in the annual nighttime, legendary Greenwich Village Halloween Parade in Manhattan, New York City. 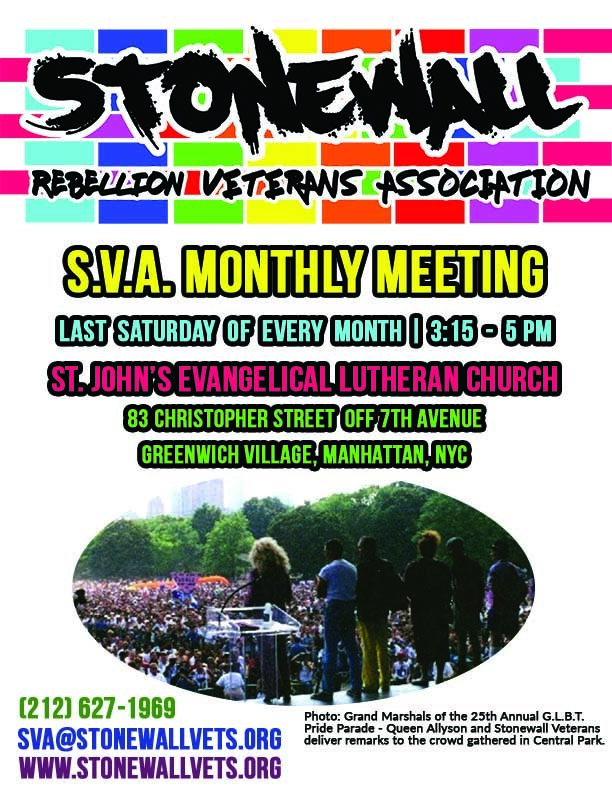 For in-person information, the STONEWALL Rebellion Veterans Association regularly meets monthly on the last Saturday. See details below. For more 411, telephone the S.V.A. at (212) 6-27-1969 (the exact date of the first night of the Stonewall Rebellion, June 27, 1969). You may also visit the S.V.A. on the worldwide web at their several million verified 'visits' a year, informative, interesting and fabulous website at: www.STONEWALLvets.org. The National STONEWALL Rebellion Veterans Association ("S.V.A.") meets every month (rain or shine, snowstorm or heatwave) on the last Saturday -- unless, of course, it is an American national holiday such as Christmas or a holiday weekend such as Thanksgiving. The time of the monthly S.V.A. meeting is from 3:15 p.m. to 5 p.m. and beyond, if needed. (Note: S.V.A. meetings were previously @ 4:15 p.m. for several decades.) The location is at the Gay, Lesbian, Bisexual and Transgender ("G.L.B.T.") Community Centre ("The Gay Centre") at 212 West 13 Street (between Greenwich Avenue and Seventh Avenue) in Manhattan, New York. The Gay Centre is accessible by car with free street parking or many paid garages. New York City Transit ("NYCT") bus routes in Manhattan near The Gay Centre are the following: M-14-A and M-14-D (14th Street), M-20 (Seventh and Eighth Avenues) and M-11 (Ninth Avenue). The Gay Centre is also convenient via the following NYCT subways: #1, #2, #3, "A", "B", "C", "D", "E", "F", "L" and "Q" (for "Queen"). If you need more "411" about the Gay Centre or to see their "Gay Groups" listing for the S.V.A., visit: www.GayCentre.org. The official National STONEWALL Rebellion Veterans Association ("S.V.A.") large button is round with a symbolic, dark pink outline of brickwork stones creating the "stone wall" effect. The impressive button includes the S.V.A. name and the year of its inception in 1969. New York City District Leader David B. Reck from Greenwich Village, NY, who was commissioned by the SVA's founder Willson L. Henderson to create this unique item, is the exclusive designer. Mr. Reck is also the sole producer of the limited edition, optional pin-on or clip-on button. The eye-catching S.V.A. 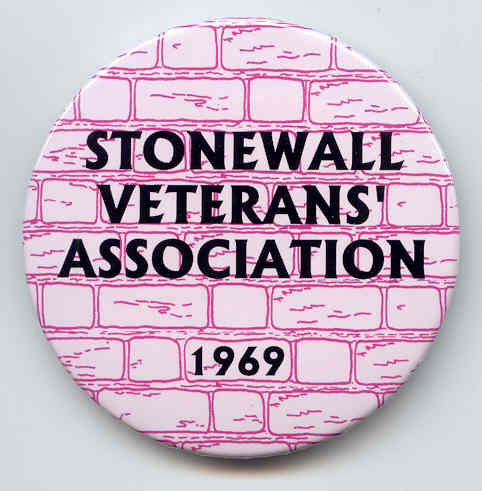 button is distributed only to: (a) the actual veterans of the 1969 Stonewall Rebellion registered as S.V.A. members; (b) the S.V.A. Board of Directors elected by the S.V.A. membership; and (c) the significant S.V.A. Honorary Members approved by the S.V.A. Board of Directors. The unique S.V.A. button is truly treasured! to half-days on Easter Good Friday, Election Day, Christmas Eve and New Year's Eve! -- the absolute and authentic authority on anything and everything "STONEWALL"! and any and all contact information. The more of the above, the better. School students should send an email and follow-up with a telephone call. Letters of request must be sent to the Stonewall veteran and to the S.V.A. SVA-ers must contact S.V.A. asap for approval of any and all interviews! must also be officially requested in writing on letterhead with full details. ("E/D"). SVA's Board shall ideally consist of five (an odd number) members. raids on the original STONEWALL Club because it was a Gay (dance) club! by Stonewall veteran Willson L. Henderson. The term is now international! which historically well-served the S.V.A. organization for four full decades! The group is now run daily by a dozen-plus member Executive Committee. Veterans' Association E/D. A majority of the great-standing and eligible S.V.A. the E/C. To vote, all Executive Committee members must be in great standing!